Outnumbered Mom: I have to love WHO? I'm supposed to love the unlovely? My children—when they’re cranky and bickering and pushing and shoving. My husband—when he’s left things a mess and doesn’t even notice. Those are easy to identify. I can spot the unlovely a mile away. But…wait! Who is that other person in the family portrait? Could that be ME? Unlovely? Oh, yes. And therein lies the problem, most of the time. I see others are far more unlovely than I am. I like to love smiling, contented children and husbands who pick up after themselves. And when I do, what am I loving? Myself. The world according to me. Can I pick and choose who’s deserving of my love? Not if I intend to model Christ. He died for the unlovely…for those who were broken and knew it…for those who knew they needed Him. He spread His arms at Calvary to encompass all of us, with our crankiness, our bickering, our messes. Before we even cared about Him, He died for us. How can I model Your love in the midst of the mess of this fallen sod, among a crush of broken souls? 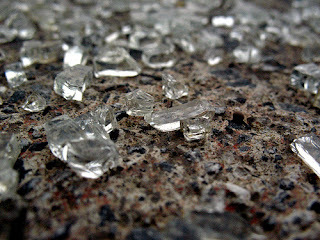 I step toward Him, and just before the broken pieces fade, I see myself reflected in those shards. As I join the unlovely, grace spills over on those around me. Beautiful. I posted II Cor 4:7 this weekend as a Scriptural inspiration, and this post definitely captures that verse. Hi, Laura! I've caught myself in this thought process many times...loving the unlovely = unconditional love. It's easy to forget how God gives grace to even unlovely ME!!! How much more must I give grace to others?! Thanks for stopping over at my blog. That's an arresting thought, that if I love everyone when they're acting like I want them to, I am really loving myself. It does help me in dealing with other people's faults to realize I have faults they're dealing with as well (usually more graciously than I am). But it helps most, as you say, to run to Him and be filled with Him. Only then can we love as we should.